The Polling Center: Are Suburban Women in the Democratic Resurgence Recipe? While the Hispanic vote has been the focus of much of the analysis of Democrats’ prospects for turning the Republican tide, in the short term, they will almost certainly need to look to suburban women — especially if Wendy Davis is at the top of the ticket. While the Hispanic vote has been the focus of much of the analysis of Democrats’ prospects for turning the Republican tide that has swamped them since 1994, in the short term, they will almost certainly need to look to suburban women in the 2014 election — especially if Wendy Davis is at the top of the ticket. However the Democratic Party, Battleground Texas and (especially) a likely Davis campaign for governor divide the labor of both increasing turnout and increasing the Democratic share of the vote, they will have to do more than wait for a big rise in Hispanic turnout if they hope to have any shot in the near term. If there exists a combination of luck and strategy that can give Davis a realistic chance of victory, suburban women will likely be a necessary part of the equation. This is because some of these women appear to be turning away from the Republican Party. Consider the last two election cycles. In the heyday of Tea Party enthusiasm, 50 percent of suburban women identified themselves as Republicans, according to the October 2010 University of Texas/Texas Tribune Poll, but that may have been the high-water mark. Two years later, in October 2012, 43 percent identified as Republicans. And in our most recent poll, June 2013, that number had dropped to 38 percent. Democratic identification over the same period increased 9 points from 37 percent to 46 percent. One reason to think that suburban women might be part of an electoral solution for the Democrats: They haven’t been swept up in the conservative ideological surge personified by the Tea Party. Between October 2010 and June 2013, conservative identification decreased from 49 percent to 38 percent among these women. And in June, while 20 percent of voters identified themselves as Tea Party Republicans, that number was 5 points lower for suburban women. Likewise, 27 percent of voters expressed the opinion that the Tea Party had too little influence, but only 20 percent of suburban women agreed. And while U.S. Sen. Ted Cruz, the guest of honor at any Tea Party, enjoys a net-favorable assessment among Texans at +9 (40 percent favorable, 31 percent unfavorable), Cruz is slightly underwater with suburban women at -2 (34 percent favorable, 36 percent unfavorable). Davis’ recent celebrity comes as a direct consequence of her support of abortion rights, which has inspired sometimes-vicious criticism. But opposition to her is far from unanimous among women, in part because suburban women are some of the biggest supporters of abortion rights in the Texas electorate: 45 percent think that abortion should be allowed in all circumstances as a matter of personal choice. 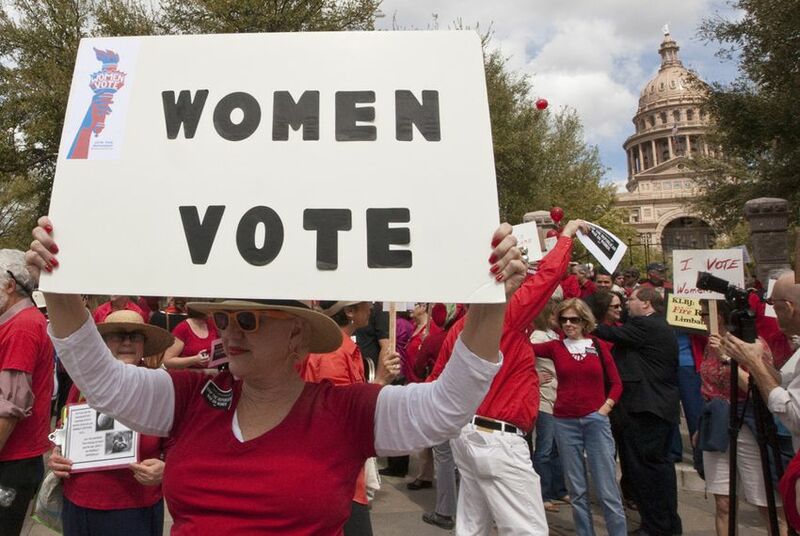 This is a big gap compared with 38 percent of all Texas women and 36 percent of Texans generally — and only 13 percent of Republicans of both genders. These numbers notwithstanding, the divisiveness of abortion and the large electoral advantage Republican candidates enjoy means that Davis would have to rely on a broader set of issues. Education is a likely theme, given Davis’ record and her expressed interests. Among suburban women, only 5 percent think that Texas’ K-12 schools are excellent, while fully 50 percent think that they’re either not very good or terrible. While this set of opinions doesn’t diverge greatly from the pool of registered voters, the pool of all registered voters tends to be more liberal than those who turn out on Election Day, and it is the expansion of the latter that will be much of the focus of a Davis campaign. Our survey data, however, suggest no other issues that hold much advantage for Davis to expand her potential support further among this group. As the relative success of George W. Bush’s “compassionate conservative” pitch illustrated — he trimmed the Democratic advantage among women down to 3 percent in 2004 — suburban women aren’t new to the electoral calculus. Prior to Barack Obama’s mobilization of the “coalition of the ascendant,” soccer or security moms (depending on who was describing them) were pegged as the key to success during the campaigns of the 2000s. This happened for good reasons that are important in not-quite-ascendant Texas: Suburban women tend to vote at higher rates than many other groups while making up a large share of the voting population. Obama’s victory was built in part on building that Democratic advantage among women back to 11 points in 2012. Whether Davis would be able to identify with and speak to suburban women in a non-presidential-election year remains an open (and speculative) question at this stage. But should she run, her prospects will hinge only in part on her ability to expand the electorate in ways that don’t simply rely on the speeding up of glacial demographic changes. She will also have to see coalitional components in the current pool of Texans already in the habit of voting. Suburban women who appear uncomfortable with the increasing power of far-right conservatives in the Texas GOP may be the place to start — they may be ready to be persuaded to make different choices come Election Day.